Fisticuffs is a well-known word in the boxing world, which means to fight with fists, which is why NetEnt has selected this name for their boxing themed video slot. The game comes with a unique classic boxing theme while still offering modern features, betting options, and rewards. There are various winning opportunities with 20 pay-lines stretched over 5 reels. In regards to features, players will get to join the fight with straight wilds, diagonal wilds, stacked wilds, and a boxing feature to ensure the match is in your favour. Winnings of up to 500 coins can be knocked out with a single punch, involving 5 of the champion’s belts on a pay-line. Fisticuffs will have you thinking about boxing in the 50’s from the moment you open the game and see the rich classic theme NetEnt has created. Various boxing items appear on the reels, which can appear in stacks to ensure the punch of each spin hits huge winnings. Players will find the champs belt, the golden trophy, the boxing gloves used to win the match, the bell, a stool, boxing shoes, and a bucket and cloth. The reels appear within a golden frame, wrapped with a cream-colored cloth to present the pay-lines. Players are invited into the ring for the round of their life and the rewards of a professional boxer. Bet values are adjustable at any time after a spin, which simply requires you to adjust the setting below the reels. Bet values of 1 to 10 are adjustable on the left, which changes the amount of coins per line, on the right, you can choose the values to these coins to either decrease the total bet amount or increase the winnings. To provide the best features related to boxing, NetEnt has selected wilds, which are sure to get things off to a good start with winnings impressing all who watch you take on the game with both hands. Players can trigger each of the features mentioned with any bet value, but a higher bet will definitely deliver a more powerful punch. All the features are presented within the regular game, meaning bonus symbols and scatters are not needed as second screen bonuses are not featured. The boxing feature is the main bonus within the game and gets things started. The straight wild need to appear on the third reel alongside a diagonal wild to trigger the boxing feature. The diagonal wild needs to be seen on reels 2 or 4 to trigger the bonus, which will offer a different mini-bonus when seen on the second reel and another when seen on the 4th reel. The straight wild will knock the other wild to reel 1 or 5, depending on the side it appears. This means you will have 3 wilds in a row, and a re-spin will follow. Should the diagonal wild feature have been triggered, the game will allow the symbols above and below the symbol to turn wild as well, and another re-spin is rewarded. Should the stacked wild feature have been triggered, the game will allow stacked wilds to appear on the other reels and also include another re-spin. 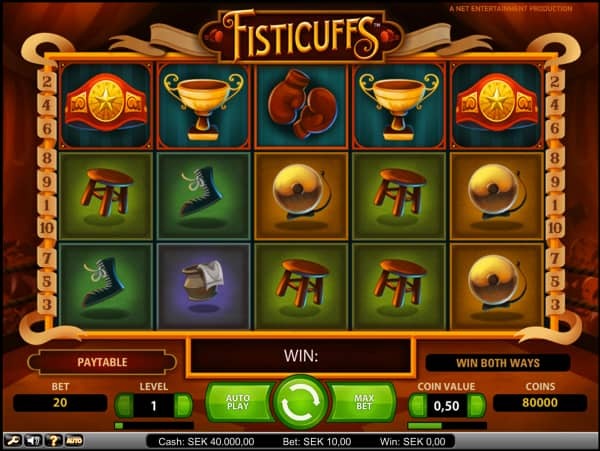 Fisticuffs video slot is a very unique game with huge winnings. This is the perfect slot for any players who are not interested in huge features, but still want to access the winnings those games provide. This high volatility slot provides an amazing payout rate of 96.70%. Fisticuffs is a popular slot with a Boxing-theme. You can try the demo version of Fisticuffs below for free. We recommend Rizk Casino, LeoVegas Casino and Codeta if you want to play with real money.